A permanent didactic show presents the long way a print does, from the printer’s vision till the stage when the print can be hanged on the wall. The visitor will be instructed through the various print techniques and the gradual stages of “artist proofs” creation. The instruction leads the visitor till the “bonne a-tirer” (BAT) stage, when the painter approves the final printing and is ready to sign the whole series. The visitors enjoy a manifold collection of prints from limited series signed by great painters who worked with Haifa Art Printers artists. The collection embraces various schools like: realism, abstract ,lyricism, impressionism, pop, surrealism, and modernism. The atelier dedicates a special corner to Judaica: microcaligraphy, ketubot, papercuts, kaballah, and jewish traditions. 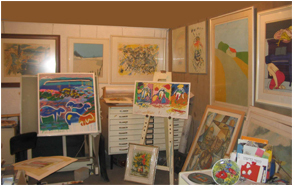 The Atelier’s artists believe in giving an opportunity to new painters and thus expose their art to the visitors. For special prices of the gallery’s silk-prints - contact us.